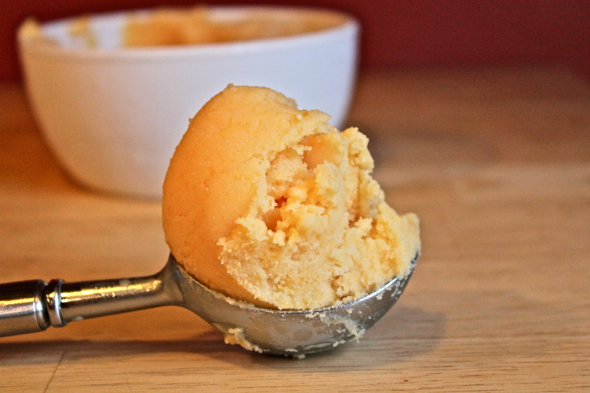 A few weeks ago, when I shared a recipe for fresh peach frozen yogurt, someone asked me a very valid question about whether there was a way to make frozen yogurt or ice cream without using an ice cream maker. Sadly, I did not know of a way, but the question got me thinking about whether or not it was possible to make creamy, homemade ice cream by just mixing things together, saying a small prayer to the ice cream gods, then plopping everything into the freezer. As it turns out, there is. Unbeknownst to me, people all around the world have been making simple freezer ice creams for decades, and, curiously, all of the recipes for those ice creams, whether they hail from the Southern United States or Southeast Asia, all contain one common ingredient: sweetened condensed milk. Now, I happen to be genetically linked to Southeast Asia, and my husband’s family hails from the South, but it had never occurred to me to use sweetened condensed milk in, well, anything. I wasn’t even sure what it was, to be honest. Sweetened condensed milk, I have found, is sweetened milk, from which the water has been removed. It is not to be confused with evaporated milk, which is a different product all together, though, as you will soon see, one with which I have also recently become acquainted. Never in a million years would I have thought that I would be sitting here telling you about a recipe that contains two processed milk items that hail from sealed cans, but sometimes life takes a funny turn. And then you find yourself sitting around eating the best mango ice cream you’ve ever had, wondering what took you so long to discover such a fantastic recipe. 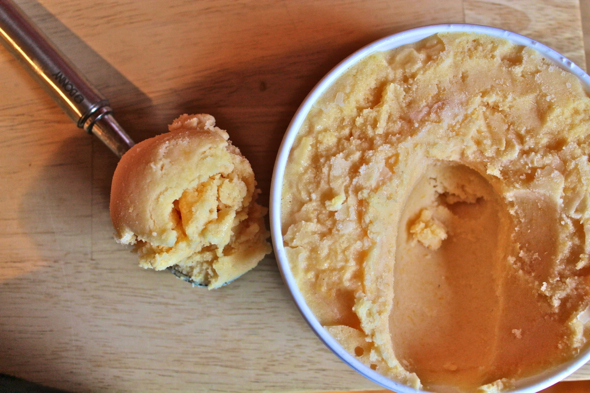 With just mangoes, sweetened condensed milk, evaporated milk, and a bit of heavy cream to make things just that much more decadent, you, too, can create this wonderful ice cream in your very own kitchen, no ice cream maker required. 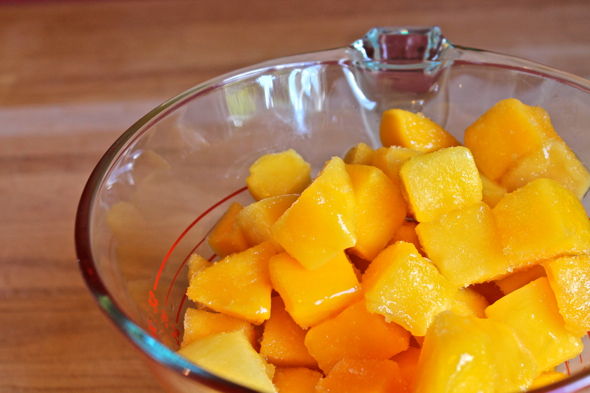 In the bowl of a food processor or large blender, puree mango chunks until smooth. 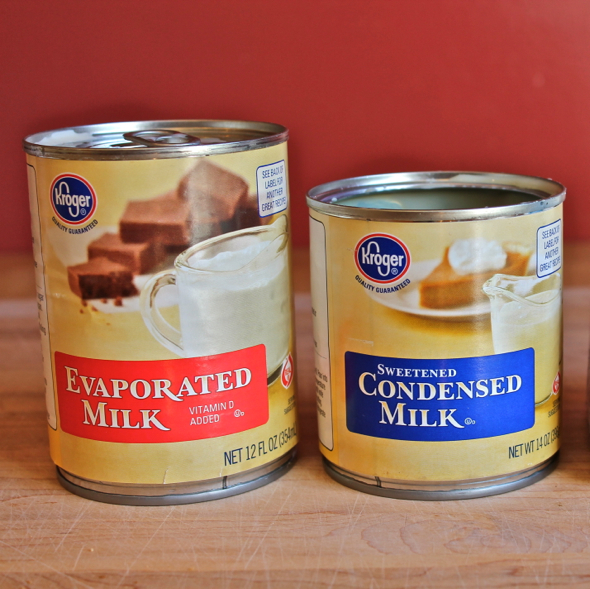 Add sweetened condensed milk, evaporated milk, and heavy cream, and blend until combined. Add lime juice and salt, and blend once more. Now, you have three different options at this point. You can either pour the mixture into a large freezer-safe container and freeze until firm, you can freeze the mixture in an ice cream maker, or you can pour the mixture into popsicle molds and freeze until completely firm (warning: this amount of ice cream mixture will make a huge number of popsicles—we’re talking more than a dozen). 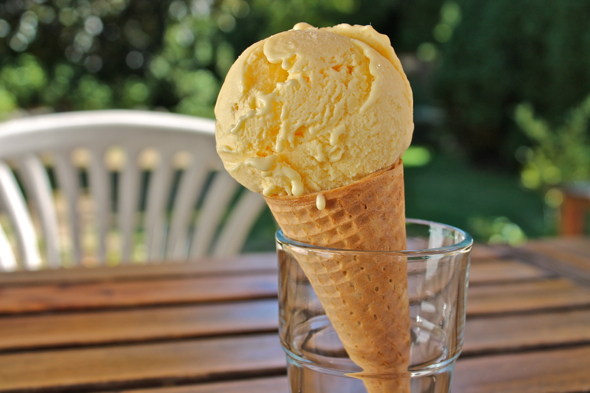 The ice cream will be done freezing when it is firm, but it will remain a bit grainy when frozen solid. If you allow the ice cream to soften at room temperature for just a bit before scooping it, you will be rewarded handsomely with the creamiest ice cream you’ve ever produced in the comfort of your own home. Makes around 6 cups of ice cream. Do you want to know the one thing I really dislike about frozen yogurt from a frozen yogurt shop (I am certain no one here has ever considered my complaints about frozen yogurt before now, but play along)? I mean, besides the fact that it is almost painfully over-sweetened? And the unappealing flavors that serve no purpose other than to satisfy a dare (cotton candy? French toast?)? And, all right, the rather mysterious list of ingredients that go into making a frozen confection taste like French toast? So, those are three things already, I know, but do you want to know the biggest complaint I have about frozen yogurt? It tastes absolutely nothing like yogurt. Believe me, I know this is a ridiculous thing to point out. However, it is also the perfect manner in which one comes to the realization that, my goodness, do you even know how easy it is to make frozen yogurt at home? Frozen yogurt that is made of actual yogurt, chopped fruit, just a sprinkling of sugar, and not much else? It’s not ice cream, of course, but that’s not what we’re going for here. What we’re looking for is a tartness that is not found in ice cream, and a focus on fruit that can oftentimes be overshadowed by the delectably forward creaminess of ice cream. This frozen yogurt is all about the two flavors of peaches and yogurt coming together. In a fit of curiosity, I added a tablespoon of bourbon to the frozen yogurt right before the mixture was ready to be pulled from the ice cream maker and, boy howdy, can I recommend that you do the same. Bright peaches, tart yogurt, and the woodsy undertone of bourbon? Now there are some things that I definitely like about frozen yogurt. 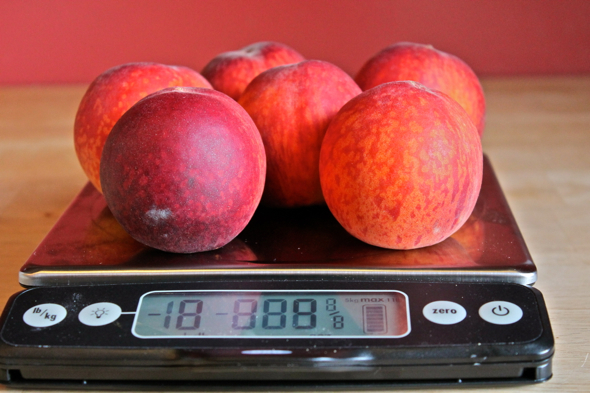 Peel the peaches (here is a great peeling tutorial–and a great recipe for a no-bake fresh peach pie! ), slice them in half, and remove the pits. Cut the peaches into chunks, and cook them with the water in a medium, nonreactive saucepan set over medium heat, covered, stirring occasionally, until soft and cooked through. 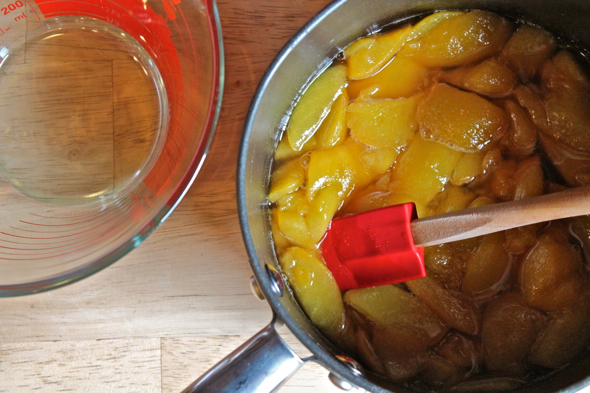 You’ll want to see the peaches sitting in a nice bed of their released syrup. Remove from the heat, stir in the sugar until it is dissolved, then cool completely in the refrigerator. When the peaches are completely cool, puree them with the yogurt in a blender, food processor, or with a stick blender. The peach mixture should be mostly smooth, but still a bit chunky. Stir in the vanilla extract and lemon juice. 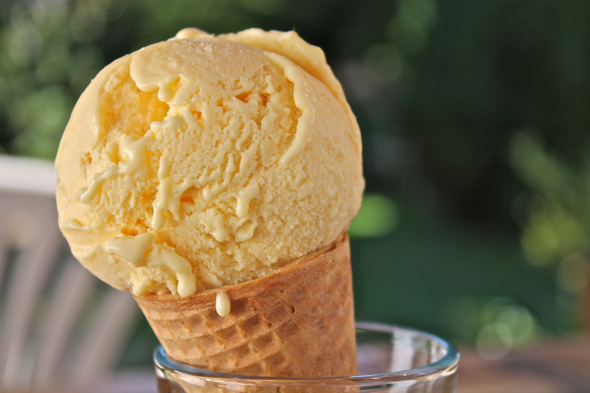 Freeze the mixture in your ice cream maker according to the manufacturer’s instructions. When the mixture reaches the consistency of super soft soft serve, add in the bourbon, then continue to freeze until the mixture is ready to be removed from the ice cream maker and packed into a freezer-safe container. This is the cake that I want in my sticky little hands when I think of coffee cake. 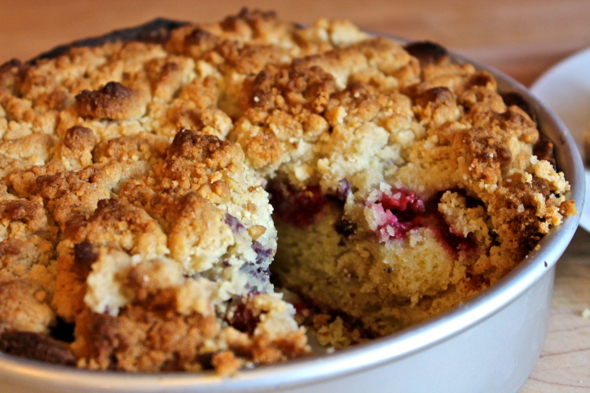 This is the cake that I want to see in front of me when I imagine a streusel-topped, berry-filled breakfast treat. This is exactly the type of cake that will make almond-phobes (no, really—those actually exist) do a complete 180 and finally come around to the realization that almond cakes are a delightful, delectable thing to behold. Not surprisingly, this cake recipe hails from the great repertoire of Tartine, the bakery that satisfies all of my bakery dreams and needs. (What? You don’t have bakery dreams and needs? 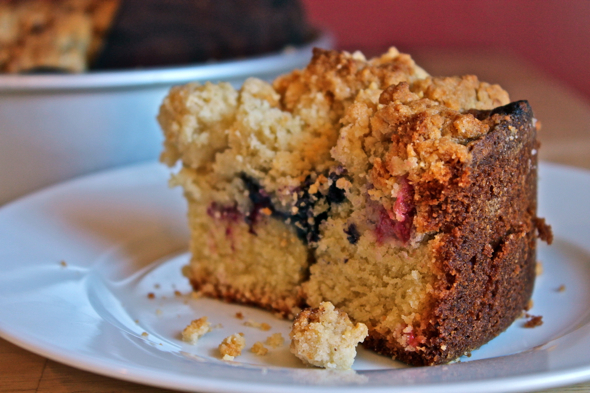 Surely, I can’t be the only one who…okay, never mind—maybe I don’t want to know the answer to that) With a light almond flavor, a perfect, buttery crumb topping, and an almost hidden layer of berries baked into delicious secrecy inside, I can’t think of another coffee cake I’ve had that checks off all the delightful, delectable boxes that this one does. And now I am going to stop talking, because you need to drop what you are doing and make this cake right now. ¾ cup (6 ounces) unsalted butter, at room temperature. Preheat oven to 350 degrees Fahrenheit. 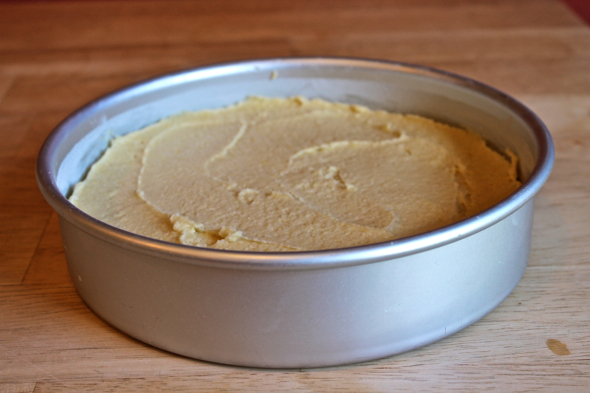 Grease and flour an 8-inch round cake pan. 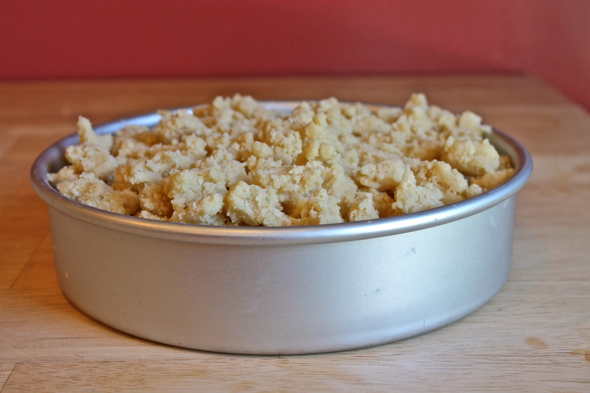 To make the crumble topping, place the butter in the bowl of a stand mixer fitted with the paddle attachment and mix on high speed until creamy. Add flour, almond meal, sugar, and salt and mix only until all of the ingredients are incorporated. 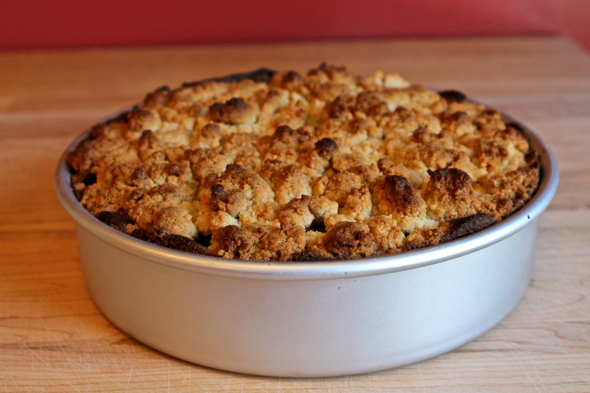 You do not want a smooth mixture; it should still have a crumble appearance. If you overmix it, cover it and chill it for about 1 hour, and then break it into crumble-sized pieces. Place the topping aside. To make the cake, place the almond paste (or your own almond and confectioners’ sugar mixture) in the large bowl of the mixer fitted with the paddle attachment and mix on low speed until the paste is broken up. Add the granulated sugar and gradually increase the speed to medium. Continue to mix until there are no lumps. Add the butter and mix until creamy, about 1 minute. 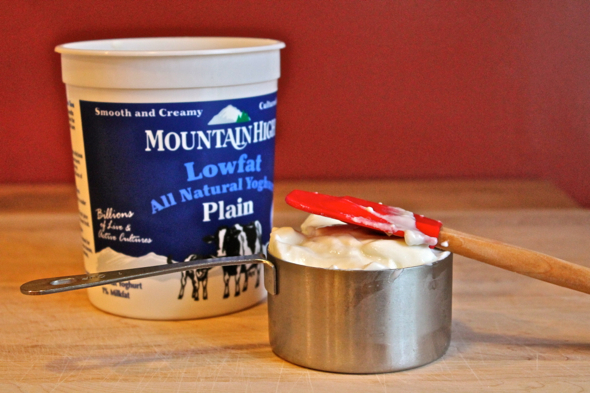 Stop the mixer as needed to scrape down the bottom and sides of the bowl with a spatula. On low speed, add the flour, baking powder, salt, and eggs all at once, then increase the speed to medium and mix just until everything is combined. Do not overmix. Bake the cake until the crumble topping is golden brown and a cake tester inserted into a non-fruity part of the cake reveals a completely cooked, non-runny cake. Tartine’s cookbook says that this will take 40 minutes to accomplish, but my cake was not done until it had baked for 60 to 70 minutes (at 40 minutes the batter was still incredibly runny). My advice to you is to check the cake at 40 minutes, then, if it’s not done, continue to bake it, checking on it every 10 minutes or so to gauge its doneness. Let the cake cool on a wire rack for at least 10 minutes before serving. 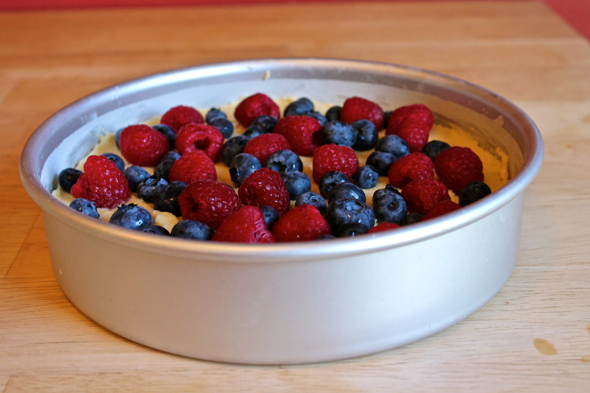 Serve the cake directly from the pan. You will not be able to reliably remove it without completely destroying the cake. Serves 8 to 12 people.